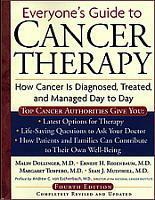 by Malin Dollinger, M.D., Ernest H. Rosenbaum, M.D. Margaret Tempero, M.D. and Sean Mulvihill, M.D. The Cancer Answer is committed to Web Site Accessibility. We took every effort in writing code for this website to ensure the visually impaired will feel welcome here. Printing: Just click the print button of your browser.